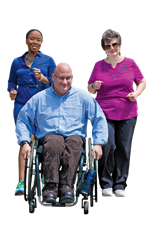 In North Carolina 37% of older adults report at least one disability. This may include a disability in mobility, cognition, independent living, vision, hearing, and/or self-care. 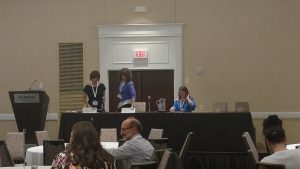 Because evidence-based programs offer proven ways to promote health and prevent disease, it is vital to be inclusive and accommodating to those participants who have disabilities. On April 13 in Rowan County (Salisbury), 25 participants from seven AAAs and their community partners gathered at the “Healthy Aging NC Leadership Retreat: Connecting great leaders in the state.” This one-day event was sponsored by the Healthy Aging NC Initiative of NC Center for Health and Wellness and the NC Division of Aging and Adult Services. Guest speakers included AARP, NC Council of Churches, Rufty-Holmes Senior Center, ESMMWL, and the Tai Chi for Arthritis Training Academy, with highlighted guests of the NC Division of Public Health–Tobacco Prevention & Control Branch, Cabarrus Health Alliance and Healthy Rowan Coalition, and the Durham County Department of Public Health. If you missed the event, and would like to learn more—check out our Training Academy Newsletter! 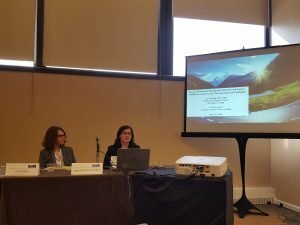 On May 22, NCCHW’s CDSME Programs Manager presented on North Carolina’s training academy at the 2018 National Council on Aging Center for Healthy Aging Annual Meeting in Washington DC. She was joined by Stephanie Stewart from the Land of Sky Area Agency on Aging, and together they presented on how Healthy Aging NC, the Training Academy at Centralina Area Agency on Aging, and our vast network of partners across the state collaborate to grow and sustain Chronic Disease Self-Management Education Programs. The powerpoint for the session can be found at healthyagingnc.com in the “Webinars” section of Healthy Aging NC’s “Resources” tab. You can also click on the link below to see the slides. Thank you Jeanne and Stephanie for sharing our important and successful work with our national colleagues and partners. North Carolina can add another vibrant falls prevention coalition to help meet local needs. 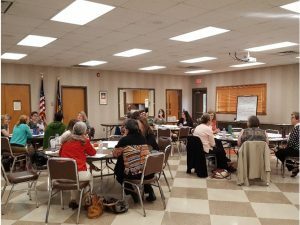 On April 17th the NC Center for Health & Wellness’ Healthy Aging NC director convened the first official meeting of the Triangle Falls Prevention Coalition. The meeting brought together leaders from public health, clinical healthcare, and the business community. The group’s vision is to cultivate collaboration between multidisciplinary professionals to reduce falls and fall-related injuries in the Triangle area of North Carolina. The mission includes fostering partnerships to increase awareness of falls risk factors, advance access to fall prevention interventions, increase empowerment among North Carolinians in the Triangle to understand and actively prevent falls, and decrease the risk and incidence of falls among Triangle residents. 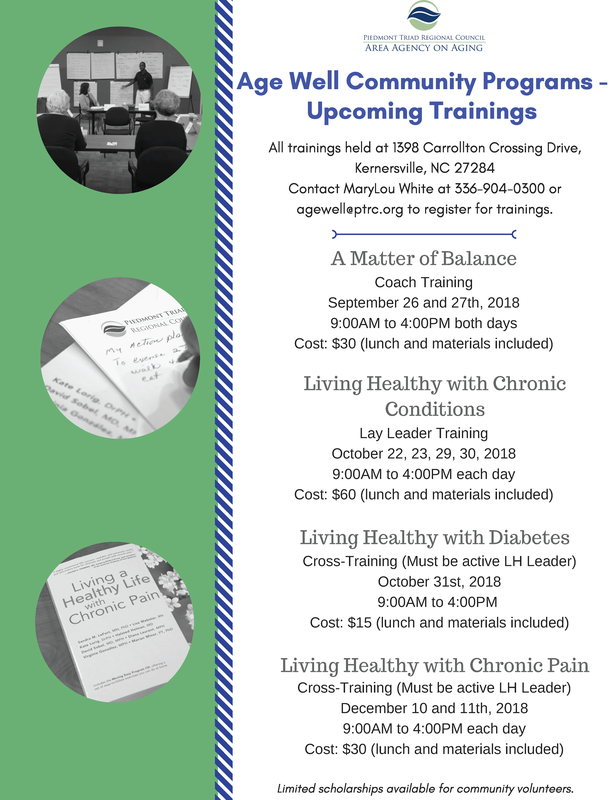 Goals include promoting falls awareness events in the Triangle community, compiling and disseminating falls prevention resources, using data to guide the coalition and sustain these efforts long term. The next meeting is tentatively scheduled for June 12 from 11am- 1pm. Inquiries can be directed to Nicolle Miller, nmiller2@unca.edu. My name is Annie Jo Buchanan and I’m the newest member of the NCCHW at UNCA team serving as a Chronic Disease and Healthy Aging Advocate. 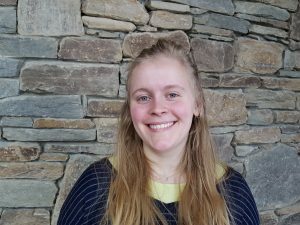 I am a psychology major with a minor in music graduating this spring. I first became interested in this position because I am passionate about disability rights and more specifically working with and creating accommodations for individuals with autism. Working with my supervisor Jeanne Dairaghi to create a disability inclusion toolkit for potential workshop leaders has been my favorite project with NCCHW so far. In my free time, I love singing with UNCA’s female and gender non-conforming a cappella group, the Bluebirds, drawing and collaging, and songwriting. A recent research article explored the costly nature of falls, both fatal and nonfatal, in older adults. The researchers determined that roughly $50 billion had been spent on fall-related treatment, with over half of that amount being pulled from both Medicare and Medicaid. With the cost expected to rise, it is more important than ever to explore preventative measures to ensure health and wellness at every age. 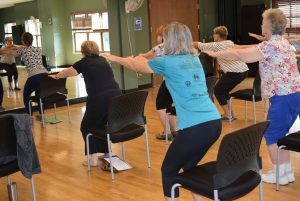 Preventative programs like Moving for Better Balance and A Matter of Balance can not only keep people safe, but can also lead to “substantial reduction in healthcare spending”. Nicole Hiegl, Tai Chi for Arthritis and Better Balance Instructor, received a heartfelt letter from a participant of one of her classes. Many thanks to Deborah W. for your recognition and praise! We hold your letter in the highest esteem and are pleased that you have found use and peace through our evidence-based programs. “I don’t think this card is actually big enough to express my thanks and praise both to you and the HCAAA! But I will try to give some specifics. You are a 5 star instructor for us seniors, perfect for me and others. You take much care to ensure our safety. You encourage and instruct in a very kind manner. Yet, you also gently correct our form when needed. I can only hope that when I get trained in the Spring that I can help other seniors find better health healing balance, flexibility, strength, and more peaceful mindfulness in their lives, as you have done so well in mine!! !